I don’t really understand how I found this graph. I don’t get what sort of a graph this is. I’m pretty sure that I couldn’t do this again on purpose. I’m baffled by my own creation. Is it a glitch? Is it for real? 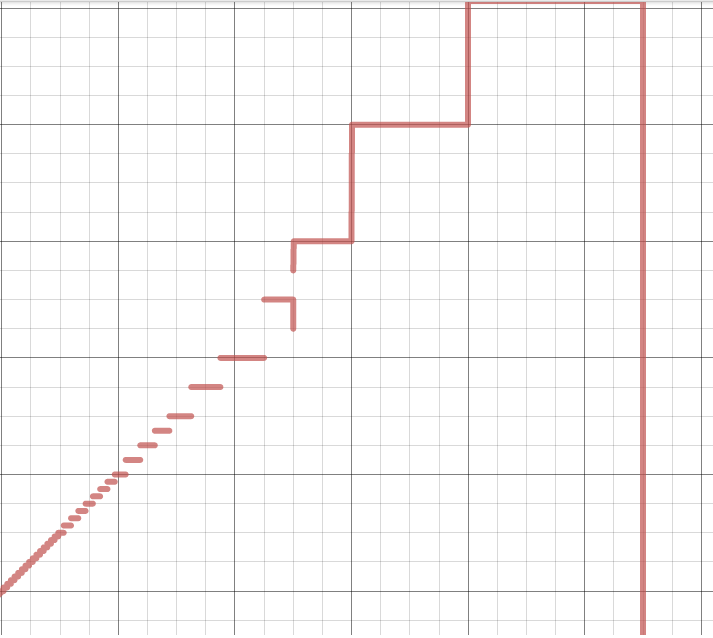 Is there a more sensible way to create this graph than my accidental discovery? Can anyone explain to me what’s going on in this graph? I’m finding myself completely lost. Update: Here’s my equation with my graph. Yes, it’s a glitch, or really just a computation limitation. Mathematically, the purple graph should just continue as y = x.
What’s happening is that the calculator can’t handle high powers of 2 properly. It doesn’t know that 2^(abs(x)) – 2^(abs(-x)) = 0 algebraically; it just plugs in for x and evaluates. For higher powers of 2, it focuses on the leading digits and ‘ignores’ the rest. I’m not sure what’s behind the limitation. It looks like it starts breaking down around 2^27. 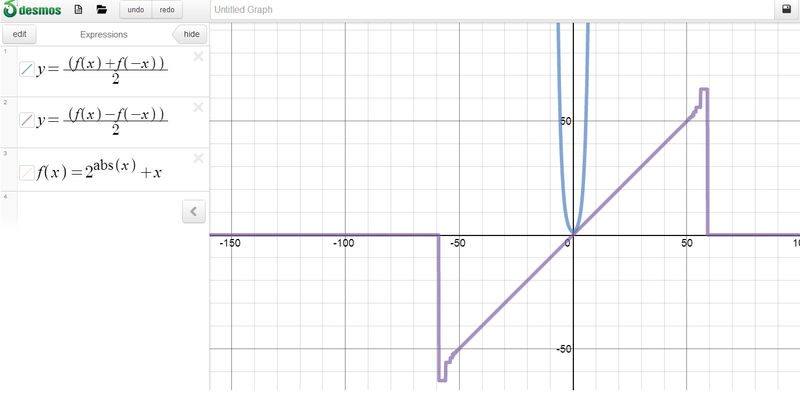 So to see the issue in a focused way, enter 2^27 in Desmos. See the 0 in the units place? Now add 5. It still says zero – it’s like it ignores the units place. Adding 10 works, but then it starts ’rounding’ again for the teens. For higher powers of 2, it starts to ignore more places, making the + x of your f(x) ineffective to cause a change. Nicely said. I’d gotten to the point where I’d worked out that the purple line *should* be y=x, but your observations about Desmos’s arithmetic are helpful. Thanks!